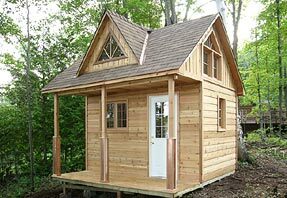 This compact 12 x 12 cabin has an 8 x 12 enclosed space, and is considered to be under 100 sq. ft. by most permitting authorities. The 10 / 12 roof pitch and optional extra height give plenty of room in the loft for sleeping. Ventilation is provided by a double opening triangular window. The dormer on the front and the shed dormer on the back further increase the room in the loft. The front door is steel and features a double-glazed window with internal security bars and a refrigerator-like door seal, ideal for colder climates. All our premium cedar doors are also available in steel construction at no extra charge. Double-glazed vinyl windows that are a close match to our cedar windows are also available. These windows provide a superior weather seal and are ideal for use with our insulation packages.